This case study was originally published on HROS.co, an awesome community for sharing knowledge and bringing open source learning approaches to the global field of HR and recruiting. After reading this article, I highly encourage you to check out their other case studies from companies Virgin Media, Oracle, and GoDaddy. Centric regularly competes with well-known consulting firms (think Accenture, IBM, etc.) for top talent. However, our company is a fraction of their size and with a proportionally minuscule brand recognition and talent acquisition budget. 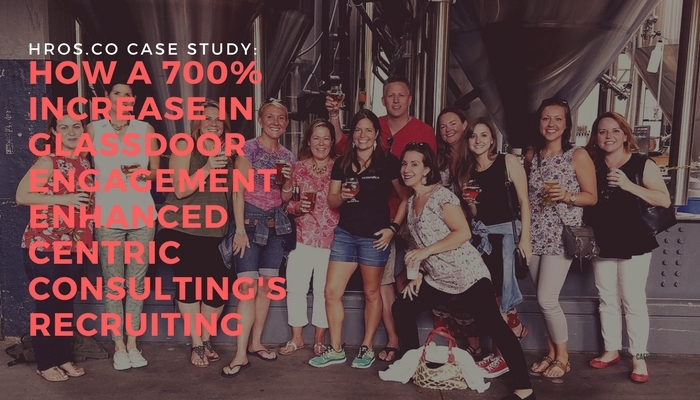 We had also grown 50% over the last two years and we needed to find new, budget-friendly methods of recruiting talent to meet our aggressive hiring goals. 1. Explained what Glassdoor was – and was not – with examples to our leadership team. The first hurdle was explaining why Glassdoor was relevant. One common myth about Glassdoor is that it’s “just a rant site.” Sure, there can be some over-the-top negative reviews out there, but the site has come a long way and there are way more reviews that are actually helpful, truthful and legitimate. To convey this fact, we showed our leaders Glassdoor pages of companies that have a healthy mixture of positive and negative reviews, along with effective leadership responses. Two good examples we found are Zillow and Overstock.com. Another common misconception we battled was that Glassdoor was the exclusive playground of the 25-and-under set. For us, this wasn’t true. Glassdoor provides detailed analytics on the age and education level of your visitors. In our case, we found that we had many mid-lifers as we did Millennials. 2. Partnered with other departments in the company to advocate for our mission. We found having Glassdoor advocates outside of talent acquisition was important. Our HR team saw it as an additional way to solicit employee feedback. While we do a formal annual Employee Satisfaction Survey, Glassdoor was an avenue to solicit more real-time and anecdotal feedback. Our marketing team also partnered with us on this as they saw it as another channel to share our branding message. Having support outside Talent Acquisition made it into a company-wide initiative and not just a small recruiting effort. 3. Asked our employees to leave reviews. This step was the scariest, at least at first. We pride ourselves in having a transparent culture where we regularly share our opinions and engage in meaningful debate. And retention rates and employee satisfaction survey results indicated that our employees were happy with the culture we had created. Nevertheless, it was a big leap of faith to ask our employees to leave honest, unfiltered reviews on a website for all the world to see. We started by creating an email template explaining (a) what Glassdoor was (b) why we were beginning to leverage it (c) asking them to leave honest (anonymous!) feedback. Next, we sent the email to about twenty employees per month. To make sure we got a good cross-section of employees, our team just went alphabetically down the list versus cherry-picking employees. It was important to us that we heard from all types of employees and from both advocates and detractors. We felt that would give our candidates the best insight into our company. We chose to send this email to a segment of our employees, versus all of them at once, for several reasons. First, it allowed us to collect feedback throughout the year. Being able to spot trends in comments in real-time was helpful to our HR team. Second, our leadership team was planning on responding to all the comments (more on that in a second! ), so we did not want to slam them with dozens of reviews to respond to at one time. Finally, my goal was to get about 60 reviews per year so we could be in contention for Glassdoor awards (and more on that in a second as well). I guessed that a quarter of the employees we asked would follow through. If five employees responded in a given month, out of the twenty asked, we would make our yearly target. 4. Asked our leadership team to respond to the reviews. Another important aspect of Centric’s culture is the visibility and openness of our leadership team. This is something we found hard to describe unless you are actually working here and experiencing it first-hand. Glassdoor allows companies to respond to reviews, and we saw that as an excellent opportunity to demonstrate the transparency of our leadership team. Knowing that our executives are crazy busy, this process needed to be as simple as possible. First, we selected a core team of leaders to respond. In our case, we chose our CEO (Dave Rosevelt), President (Larry English), VP of Technology (Mike Brannan) and Operations Director (Matt Henretta). Their collective backgrounds and responsibility areas were broad enough that we felt we could adequately respond to most questions. Next, we showed them examples of companies that were responding to reviews right (see Step 1) and discussed the tone we wanted to use. We felt it was important to us to be humble, appreciative and transparent. Finally, we divided the reviews between the four responders by content area. If an employee compliment or concern revolved around benefits, our HR director responded. Likewise, if the review addressed company strategy, the CEO would respond. And so on. We made a goal to respond to every review, good, bad or ugly. To facilitate this, and knowing how busy our leadership team is, we sent out a summary email to the group each month. The email included the headline of each new review, who was assigned, and a link straight to the review to respond. The team found this very helpful. Glassdoor publishes a handful of awards each year based on employee reviews on the site. Two of the biggest ones are the “Best Places to Work” and “Highest Rated CEOs”. Their methodology for choosing winners is proprietary and not explicitly published. However, they do publish some of the criteria which include having a certain number of reviews and having a qualifying company (or CEO rating). For the small and medium business category which we fall into, we needed at least 35 reviews. And, after reviewing previous years’ winners, I estimated we need a rating of at least 3.7 for the BPTW award. There is not much you can do (honestly) to influence your overall rating other than having a place people like to work at. However, you can influence the number of reviews you have on the site. We were pretty aggressive in asking employees to leave reviews so that we could meet the thirty-five review threshold. Please note that asking thirty-five employees to leave reviews does not mean you will get thirty-five reviews. In our case, we found that for every 3-4 people we asked, only one would leave a review. So, definitely ask much more people than you need! 6. Promoted the sh** out our wins! If you are lucky enough to win, Glassdoor will provide you a media kit with templates for many of these things. While we did not use them word by word, we did find them a helpful starting point. With a limited budget, it was important for us to maximize our Glassdoor investment using the free options the site provides. In fact, everything we mentioned so far cost us nothing – having employees leave reviews, leadership responses to reviews and winning awards. While the things above are extremely important to building your brand, there is still the practical element of helping candidates find and apply for your jobs. The “jobs” part of Glassdoor is not free (they have to stay in business somehow after all!) However, we felt it was an important element to tie branding with candidate action. By having our current jobs listed on our Glassdoor page, and in the search results, we felt we could best capitalize on our strong employer brand. At the time, this purchase was the most we had ever spent on a recruiting tool or advertising. It was not a decision we took lightly. 8. Reviewed results (and stories) to quantify our investment. Any leader loves a good ROI story. We gave it to them. Glassdoor provides a wealth of information on their employer dashboard. We included a summary of these analytics to our leadership team monthly along with their review response assignments. We also kept track of those things that can not be quantified such as anecdotal stories that can prove just as impactful. For instance, the story about the all-star candidate who mentioned how he was blown away that the CEO responded to employee concerns on Glassdoor. Or the story about the former employee who referred several candidates because an executive took the time to consider their departing feedback. These stories matter just as much as the data does. Glassdoor became a top five source of traffic to our corporate website. When we started this effort, we received virtually no visits via Glassdoor. We won the Glassdoor 2016 Best Places to Work and Top CEO awards which resulted in multiple media pickups and numerous social media mentions. And those branding efforts paid off: Glassdoor was a direct source of about a third of our hires from job boards. And it was an influencer of many other hires. The costs were very reasonable as well, at about $1,650/hire. One of the unexpected results of this effort was an impact on business development. Our intent all along was to enhance our talent acquisition function. However, we found our Glassdoor presence also supplemented sales efforts. Several of our business development people indicated that potential clients researched us on Glassdoor before awarding us contracts. Glassdoor gave them a window into the culture of the organization that they would be partnering with. While it is difficult to pinpoint the exact dollars of sold work that was influenced by Glassdoor, I am happy to say that 2015 was the biggest revenue year in the history of Centric. While our team is raving fans of Glassdoor now, it was a hard sell initially. In particular, we had a lot of pushback that Glassdoor was “for the kids” and would not yield the experienced candidates we typically hire. We could have done a much better job explaining what Glassdoor was, and who their users were, at the onset. This would have made buy-in and adoption quicker and smoother. Another area where we could have done better was providing stronger talking points for our talent acquisition team. As candidates began researching us more and more, they had specific questions about things they read in the reviews. For instance, some employees left comments about learning and training which caused candidates to ask our recruiters about our training programs. It would have made our recruiters’ lives easier if we had a cheat sheet outlining what we were doing now for training and the improvements to the program that were in process. Finally, we were just not prepared for the influx of candidates that Glassdoor brought. (I know, good problem to have…) Until we figured out an efficient way to review and respond to the candidates, it was very taxing. Be careful what you wish for! Candidates crave an authentic view into your company’s culture. Your employees are the best people to give candidates that perspective. Likewise, showing the human side of your leadership team builds trust both internally and with candidates. Candid and public responses to employee comments and concerns go a long way to building trust with employees and candidates. We mainly relied on Glassdoor’s built-in dashboard to track performance. We also leveraged Google Analytics on the centricconsulting.com website.